Sweet Dreams offer fantastic space-saving bunk bed solutions for bedrooms that are shared by more than one child. 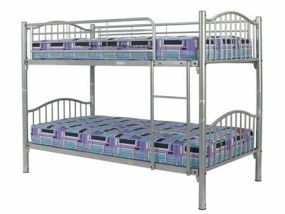 With a selection of single and double bunk beds available, you can ensure that all of your children will be able to sleep comfortably, and that there will be enough room for all of their bedroom furniture. Some have easy-climb angled ladders for a safer climb between bunks. 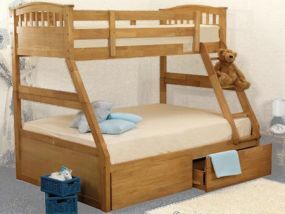 Other bunk beds from Sweet Dreams can be split into two separate beds, ideal for when your children grow or eventually move into separate bedrooms. While some beds feature drawers for storing all of your children's bedtime essentials, the rest boast plenty of storage space underneath the frame. With both metal and wooden bed frames available in an array of colours, you are sure to find a bunk bed from Sweet Dreams that is perfect for your children's bedroom.